When recovering alcoholic Michael Z began sending quotes he had heard in the 12 Step meetings he had attended to a small group of friends he never expected that his weekly email would turn into a global phenomenon and a book. In the meeting rooms of recovery millions of lives have been saved from the disease of addiction by the power 12 Step programs. Over a series of years, quietly and anonymously on his own journey of recovery, author Michael Z collected and wrote down the sayings and quotes he heard in the various 12 Step meetings he attended. A little over a year ago, he began sending these quotes via email to a small group of friends. He soon began receiving requests to be added to his Monday morning email list which within just a few months exploded into the thousands worldwide. Astonished by the response to his simple email Michael Z created http://www.TheWisdomoftheRooms.com. 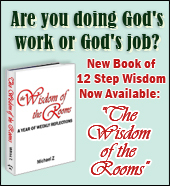 As his readership expanded over the following year, Michael Z put his weekly 12 Step quotes and reflections into a new book entitled, "The Wisdom of the Rooms: A Year of Weekly Reflections." The book was an immediate hit and readers are already raving that this book is changing lives. "What a fantastic collection," Barb Metcalfe, Public Relations director of The Orchard Recovery Center (in British Columbia) says. "The Wisdom of the Rooms takes the myriad quotes heard throughout the recovery community, puts them all in one place, and persuades the reader to deepen her meaning and commitment to the process." Through quotes like, "Instead of telling God how big your fears are, start telling your fears how big your God is," Michael Z challenges the reader to reflect on daily struggles and to act on this wisdom in their own lives. Readers are encouraged to reflect on one of 52 quotes each week by answering a series six questions that are related to each quote. The Wisdom of the Rooms helps those both in and out of recovery. One weekly reader writes, "As the mother of a struggling teen addict, our family tales are the same as many. Reading this inspiration each week has helped me gain a certain perspective of the trials and tribulations my son faces and an understanding of his struggles that he is unable to explain. Each week, you fill my glass with hope." Michael Z lives in Los Angeles, CA, where he works as a psychotherapist intern and Life Skills coach. He has worked the 12 Steps in a variety of programs and lectures and leads workshops and retreats on the journey of recovery. Each week thousands of subscribers across the globe receive his Monday morning email and visit http://www.TheWisdomoftheRooms.com.